“Sprinklers no longer a mandate in Pennsylvania! Governor Tom Corbett today signed his first bill, House Bill 377 which removes the sprinkler mandate on all newly constructed one- and two-family homes. The new law is Act 1 of 2011. Now that sprinklers are a consumer choice, builders must offer a buyer the option of installing sprinklers. Builders must also provide the buyer with information made available by the State Fire Commissioner on the possible benefits of installing a sprinkler system. Among other things House Bill 377 will also change the codes adoption process in Pennsylvania and require increased standards for fire protection of flooring. Today, I took an investor to see a home on the out skirts of Pittsburgh.Â We new it was going to be a rough one.Â Check out the strange photos I took on my cell phone.Â The house was built into a hill and it even touches the stone wall.Â This can be good.Â Also, it appeared that someone had bought it to maybe flip at some point and had done some strange remodeling. Medicine cabinet by the toilet.Â ?? ?Â There was one by the sink too. 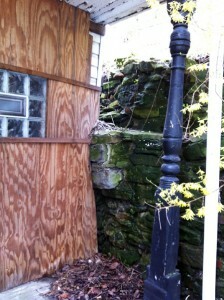 Looked like in this photo and below they built this part of the house around a falling stone wall. The buyer decided to pass. 1. Just because a house looks good does not mean it is. There could be”mold like” substances hiding behind walls and floorboards which could lead to costly repairs. Sometimes a foreclosure or fixer upper can look run down and have an excellent shell and important interior parts. Recently I took a buyer into a an older $22,000 – 4 bedroom foreclosure. You could tell the home was wonderful in its day. But what we found out was that some of the beams in the basement were burned. Insurance money, we thought, had made some nice upgrades but . 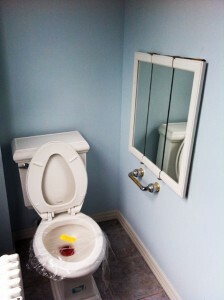 . . there was also the hidden issue of the home being required to tap in to new sewer lines in the town – ouch! I made sure any interested parties were aware. Also, don’t rely on any previous inspections if there would be any. 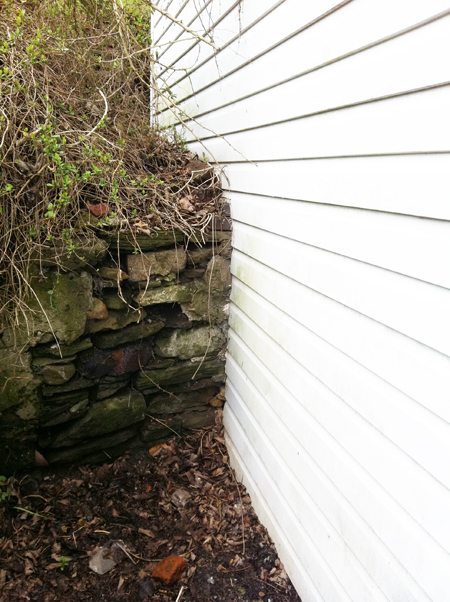 Empty homes can deteriorate quickly. I always suggest buyers have an inspection. Also you should check the sewer/septic and water statuses as some banks claim to know nothing about whether these systems exist or are currently in working order. 2. Price is should not always be the focus. The price will get many people’s attention. You want to research quality of the school district, location, crime rate and even the view, and accessibility. Also financial problems are not always the main reason for every foreclosure. 3. Don’t be tempted to “flip” the house. Sometimes the price is not always low enough for a neighborhood to get your money back out of the flip. Always consult a real estate professional, home inspector or a contractor if you lack that knowledge. 4. Stick to a budget. Buyers need to make sure that they have the money to repair what they need or want repaired. Buyers should avoid taking additional loans. A great option in some cases is a rehab loan. For example, there is a loan called a 203K rehab loan (not all loan agents have knowledge of how to run them nor do all want to). This loan will escrow money for needed repairs that are are required to get financing or even additional things that are desirable to do. 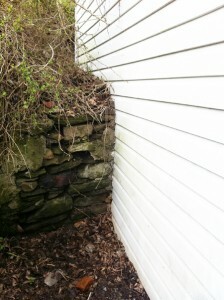 Here is a neat article with before and after photos of a remodeled fixer upper. You have to have vision when purchasing a home like this. As an agent, is amazing to see what different people see when they walk into a home.